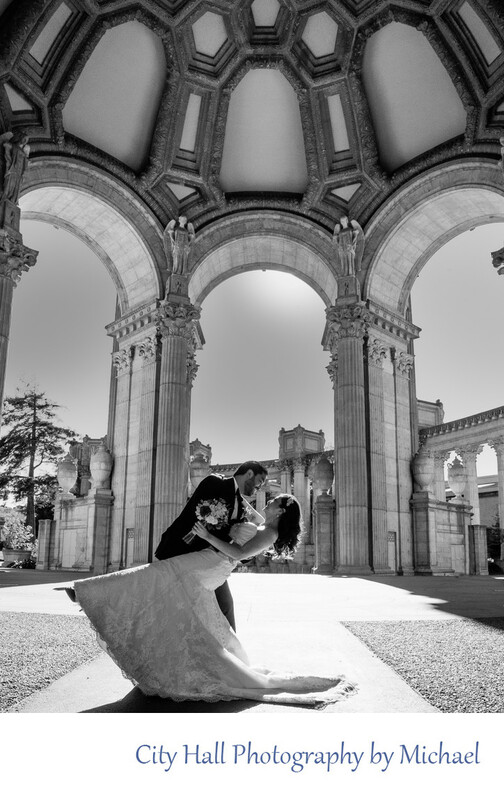 Many of our City Hall clients ask us to take them to the Palace of Fine Arts after their wedding. It is definitely one the most popular destinations of our clients who have their nuptials in San Francisco. We enjoy taking brides and grooms to some of the less obvious places at this iconic location. The one challenge at The Palace is to find areas free of tourists. Fortunately, we have discovered over the years some great places to take our recently married couples that are less populated. We walk around to the back of Rotunda and find great backgrounds with beautiful architecture. The image above was taken in the Rotunda with an off camera flash.